In this post, you’ll learn which laws you need to keep in mind for drone flights in Fiji. In Fiji, drone users have to register with the Civil Aviation Authority of Fiji (CAAF). Application Forms are available for registration, which you can fill out in advance and mail to info@caaf.org.fj or hand in at the airport upon arrival. Special regulations apply to commercial users and drones above 7 kg starting mass. In these cases, you have to be licensed as a pilot. Maximum altitude: Fiji flights are permitted up to a height of 61 meters (200 feet). Compulsory insurance: Depending on the classification of your copter you need an aviation liability insurance in Fiji. However, I recommend that you always buy a particular drone liability insurance. Distance to airports: To domestic airports, a distance of 3 kilometers is to be kept. At international airports, a distance of 5 kilometers must be taken into account. Commercial pilot regulations: Commercial Copter pilots require the approval of the CAA for use in Fiji. We have researched the listed drone regulations for Fiji to the best of our knowledge. We cannot guarantee the correctness of the information. If you want to be on the safe side, contact the competent aviation authority. Alternatively, you can also ask the embassy in your country for further information about the regulations. Please leave us a comment when you receive news and/or gain experience with your copter in Fiji! Hello, we’re planning to go to FIJI this month. Just a quick question, where did you send the applications form? Is it thru email or when you arrive there? Thanks in advance. I’m glad I found your website. Hi Chad and Ryan, sorry I just recently saw this message on my email. This is what I did: I download the form> OP 137 – Permission to Operate Small RPAS on http://www.caaf.org.fj. Just fill it up, scan and send it to info@caaf.org.fj . Just wait few days, someone will reply and will give you approval. 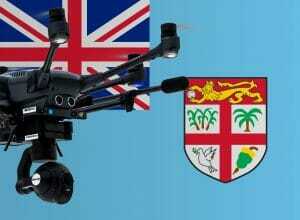 Just don’t forget to bring the original form and read Fiji aviation rules for bringing drone. I hand carry my drone, they didn’t check or ask me to show the original form on the airport. By the way mine is dji-mavic air. Hope it helps. Thanks for your message here, it is very helpful. ” Just wait few days, someone will reply and will give you approval.” Did they just sending an email with approval, then you print it out when you go? Or you get the approval at the airport when you arrive? I am going there in a week, so time is limited for me to request approval. Any more info is great appreciated.